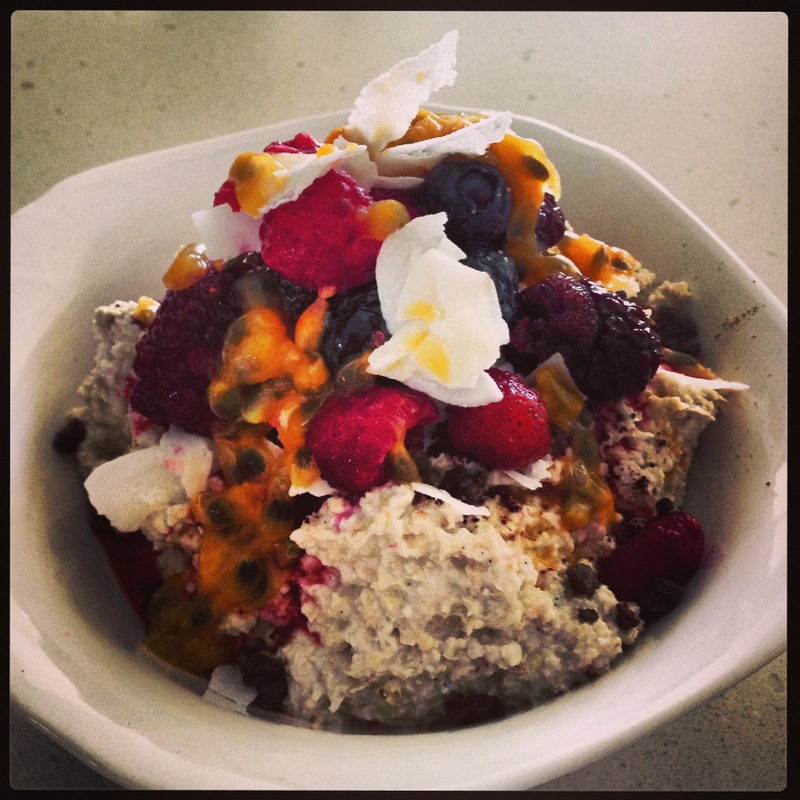 This recipe has been converted from Emily Skye’s 30 Day Shred which I am loving for breaky at the moment! It’s filling, nutritious and gluten free. I make enough of this for 5 days and mix it up between either apple and coconut or banana which gets me through the work week. 170g quinoa (this makes enough for 5 days). Firstly, rinse the quinoa under running water and place in your TM basket. Next add, 500g of water to your TM bowl and cook the quinoa for 18 mins, 100 degrees, speed 1. You can either leave it in one bowl or portion out into individual containers (approximately half a cup per serve). Next you need to make your almond milk. 100g of almonds (preferably soaked overnight or at least a couple of hours). Drain soaking water from almonds and place in your TM bowl with the filtered water. Blend on speed 10 for 2 mins and then strain through a nut bag or chux/muslin cloth. Don’t throw away your pulp, you can make my raw almond pulp fudge, protein balls, dehydrate it and use it as almond meal, add it to your smoothies or freeze it for later. For the Apple & Coconut Bowl (pictured below), place 1 chopped apple (to chop your apple, place quartered apple into TM bowl and chop for 4 seconds on speed 4) and 1/2 cup quinoa into your bowl and add 1/2 – 1 cup of almond milk. 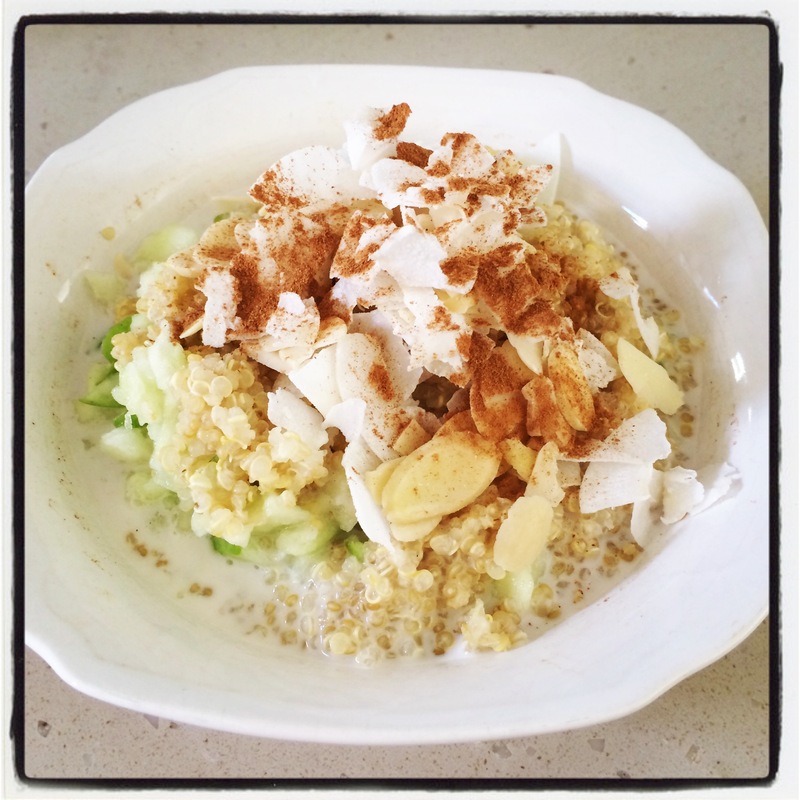 Top with flaked almonds, shredded coconut and cinnamon. For the Banana Bowl, place 1/2 cup quinoa and 1 sliced banana into your bowl. Add 1/2 cup – 1 cup of almond milk and top with flaked almonds and cinnamon. 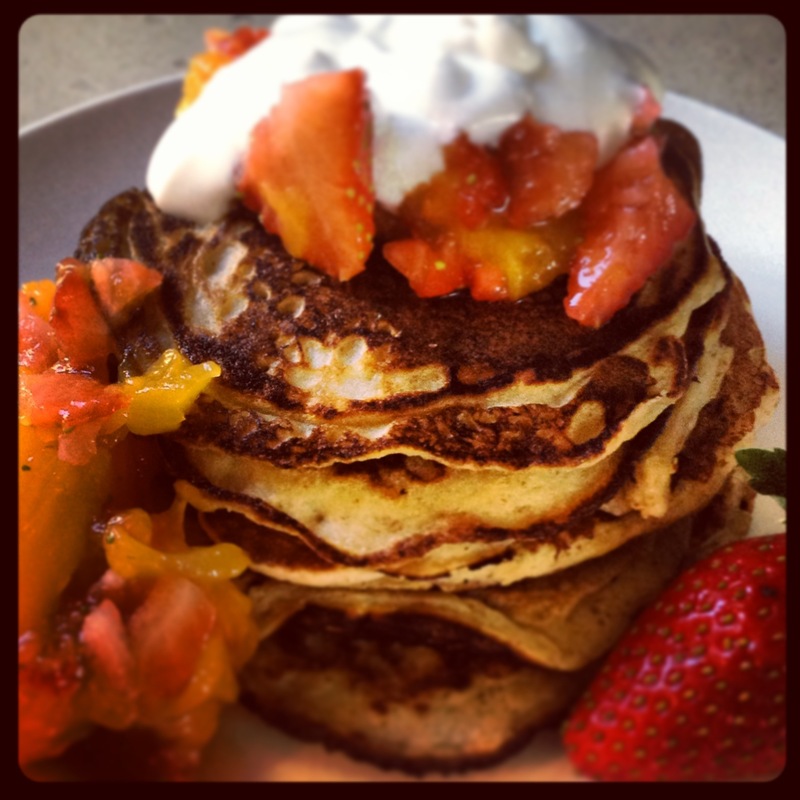 Whenever I’m looking for some food inspiration, I always check out Teresa Cutters website, The Healthy Chef. I wanted to make something that I could freeze into portions for lunch on the run. So often on the weekends I am out and about so I take a little esky with me, whip up a green smoothie, chuck in a protein ball and take something out the freezer that I can eat in the car. These fritters were really easy to make and made a huge quantity! Place zucchini in TM bowl and chop for 4-5 seconds on speed 4. Place in a colander, sprinkle with salt and leave for 10 minutes. Squeeze out all the moisture from the zucchini with your hands. Place lemon peel into TM bowl and zest on speed 8 for 4-5 seconds. Add parsley, mint and spring onions into TM bowl and chop for 2-3 seconds on speed 8. Add peas, pepper, eggs, zucchini and almond meal to TM bowl and mix on reverse, speed 4 for 5 seconds or until combined. Teresa’s recipe asks at this stage to test cook a fritter to make sure it holds together well. If not, add some more almond meal or alternative flour if you need it. Cook fritters in a pan over a medium heat in a little olive oil for 2 minutes each side or until cooked through. Serve with salad or eat on their own as a snack! 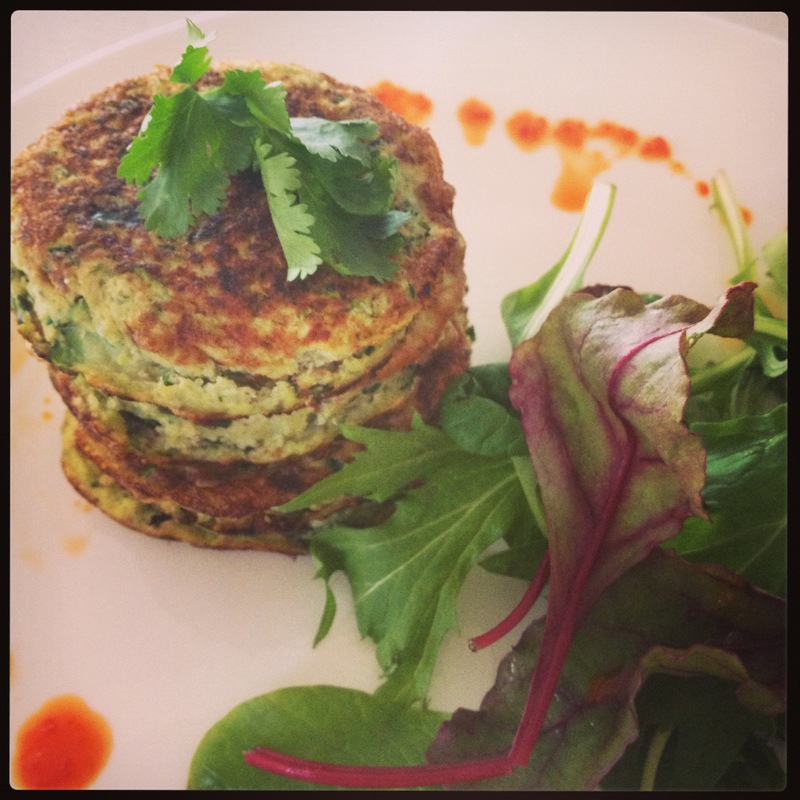 This is another recipe I have converted from the Green Kitchen app which I love! I had wanted to try a buckwheat porridge without sprouting or cooking the buckwheat and this one is perfect. You only need to soak the buckwheat and nuts for around 1 hour which is great if you forget to soak them the night before. I make this porridge on the weekend and divide up the portions so it lasts me the week. 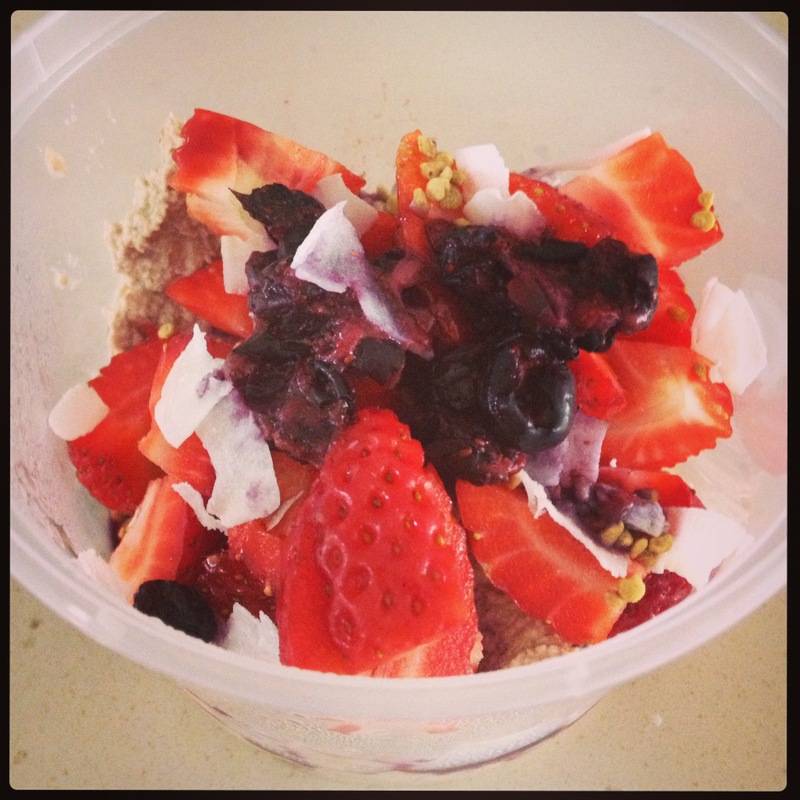 Each morning I then top the porridge with some extra goodies which keeps me full until lunchtime. Rinse in cold water and drain. Place all ingredients into TM bowl and blend for 10 seconds, speed 8 or until smooth. Top with some of your favourites – fresh berries, pomegranate, bee pollen, cacao nibs, coconut flakes, nut butter, yoghurt, hemp seeds etc. Well the title may say burgers, but mine certainly didn’t work out as burgers!! My burgers kind of stayed together but I admitted defeat and enjoyed the burgers crumbled over a salad instead. 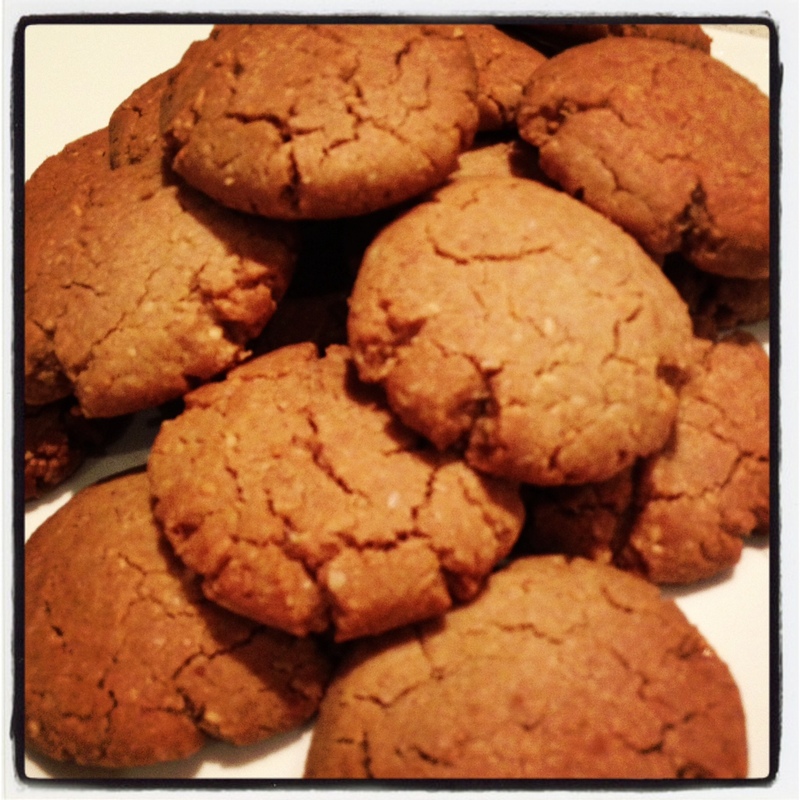 This recipe is from the Green Kitchen app which I have converted for the thermomix. Place water in a small pot and bring to the boil. Add millet, salt and fennel and simmer for approximately 10 minutes or until tender and set aside. Place parsley into TM bowl and chop for 1-2 seconds, speed 8. Add beetroot, zucchini, carrot and onion and chop for 4-5 seconds on speed 5. Scrape down the sides and check the consistency. You may want to chop for a further few seconds. Add the millet, eggs, salt and pepper to the vegetables and mix on reverse, 5 seconds, speed 5. If the mixture feels too juicy, you can add some flour, oats or more millet. Cook in a pan for two mins each side and serve as traditional burgers or with some salad. 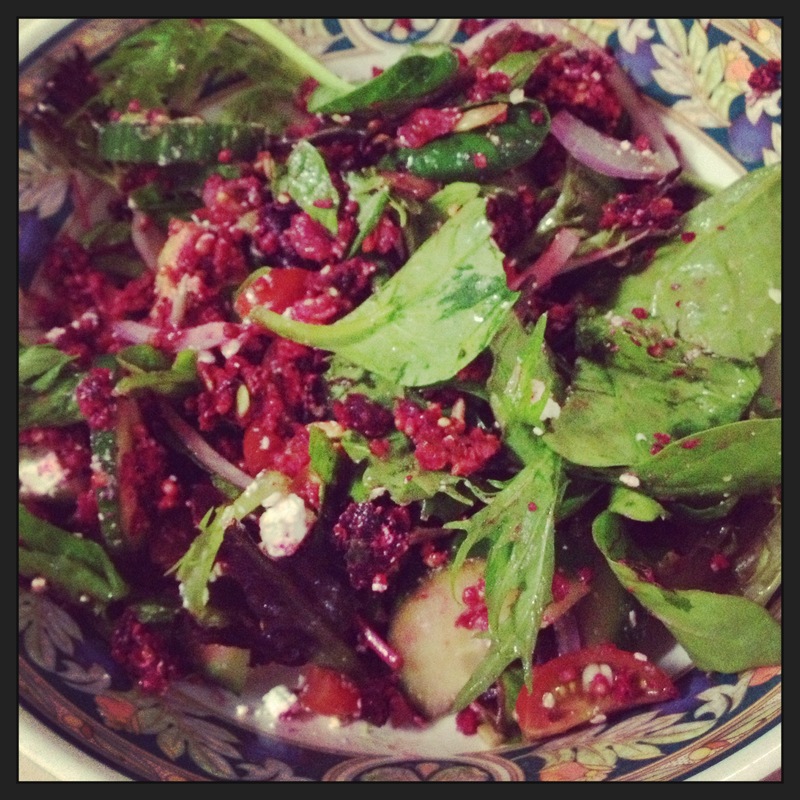 In my case crumble the beetroot burgers over a salad and enjoy as a beetroot, millet salad! I recently downloaded the Green Kitchen Desserts App and scrolling through I found these Peanut Butter and Tahini cookies. I have converted the recipe for the Thermomix but you can click here to download the app with the original recipe. Place buckwheat into TM bowl and mill for 1 min, speed 9. Add your oats and mill for 5 seconds, speed 9. Next add the baking soda, cinnamon and salt and mix for 2 seconds, speed 4 and set aside. Place oil, peanut butter, tahini and maple syrup into TM bowl and heat for 2 mins, 80 degrees, speed 1. Add the dry mixture and mix for 20 seconds, speed 3. Divide into 20 portions, roll and flatten into cookies and bake for 10 mins, 180 degrees. You may have seen this recipe on my blog about strawberry jam, but after making these this morning for breakfast, they deserve their own post! So simple, easy and only 4 ingredients! I added cinnamon to the pancakes today as cinnamon improves insulin’s efficiency, which helps regulate blood sugar levels. It is also said to lower blood glucose levels. Mix all ingredients in TM bowl for 4-5 seconds until combined. I topped mine with some strawberries and peaches that I chopped in the TM bowl for 3 secs on speed 5 and dolloped with my new favourite coconut yoghurt, Coyo. I bought this so I had the starter to make my own coconut yoghurt but at this rate, it will all be gone before I get a chance to make it! I was at work last week getting my lunch out the fridge and I couldn’t help myself when I saw this packet soup next to the sink. I picked it up and turned it over to have a look at the ingredients…..
Apart from having over 15 additives/preservatives and 45 ingredients, there was something really quite alarming in one of the ingredients. 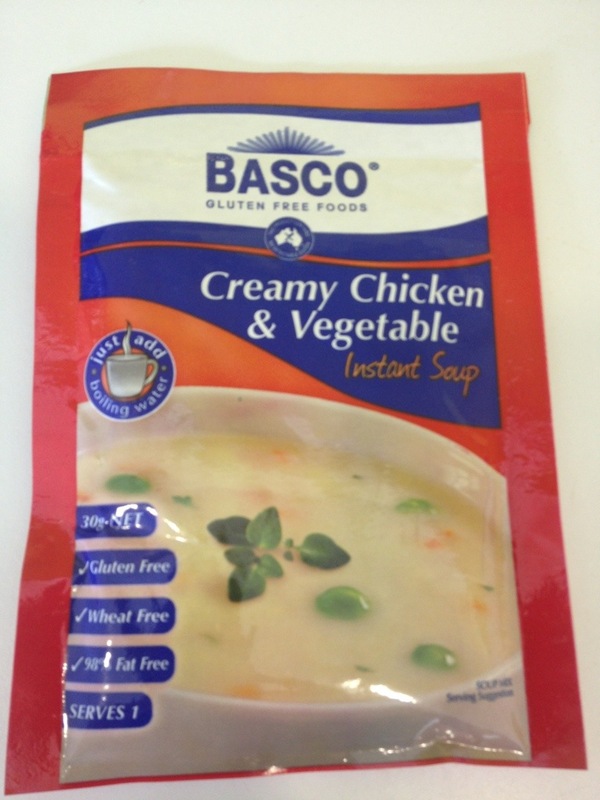 As you can see from the photo, this soup is Gluten Free however if you look at the additive 1450, Starch Sodium Octenylsuccinate which is used as a stabilizer/thickener it is recommended that people on a gluten free diet should avoid. I cannot stress enough that you need to read the labels of the packaged food you are buying. The gluten free aisles at the supermarket are becoming more and more popular due to the amount of people trying to avoid gluten in their diets or for those that are diagnosed as coeliac. If you take the time to read what else is in those foods and actually care about your health, you wouldn’t be buying this crap. 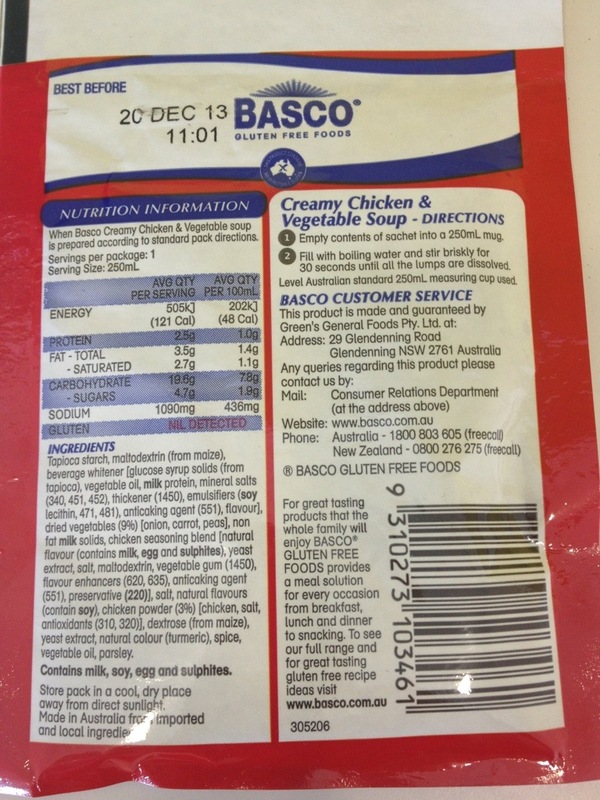 Below are a just a few of the nasty additives in this packet soup. If you don’t have the Chemical Maze app, click here for more information. This is the quickest way to find out what is really in the food you are buying! Remember, fresh is best but if you have to buy convenience foods, please read your labels!